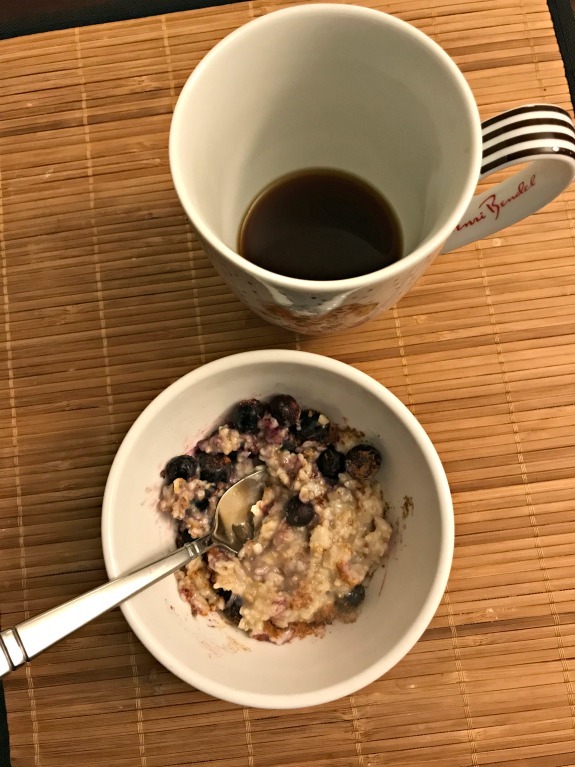 Let’s take a look at Monday’s Meals for today’s What I Ate Wednesday! 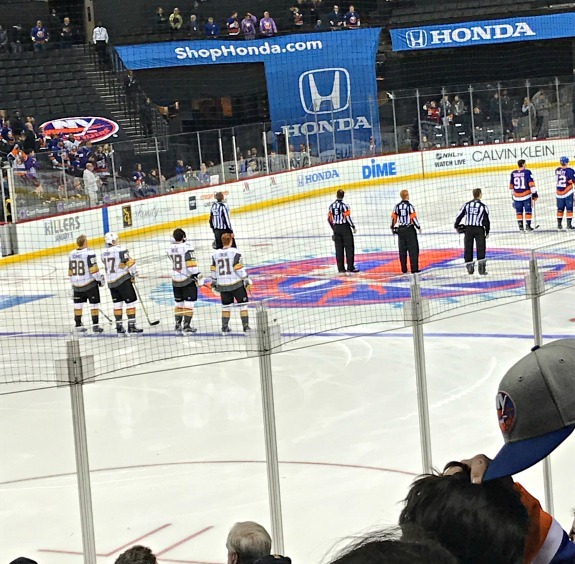 Monday was a busy work day AND my son talked me into going to the Islanders game at night. The Vegas Golden Knights would be in town for the first time in their history and he didn’t want to miss it. Ugh, a Monday night game in Brooklyn! Also, I want to throw in here that I have been working on a post about the scale. I thought I would get it up yesterday but I didn’t finish it in time. The late night Monday (this is why I hate that the Islanders play in Brooklyn, takes forever to get home) had me sleep later yesterday morning which meant I didn’t have time to finalize the post. I hate when that happens but I am getting better at letting it go and saving the post for another day! This breakfast could really be any morning, any day of the week. I always drink a cup of coffee before heating up my oatmeal. This time I remember to add chia seeds again to the pot of oatmeal while it was cooking. I was always good about adding chia seeds to my oatmeal but then I fell out of the habit. I ran 6 miles and then had another bowl that looked like the above after my shower. I was starving early on so I made a salad for lunch before noon. This salad was pretty basic with a Dr. Praeger’s veggie burger chopped up, balsamic vinegar and a few jalapeños because I am obsessed. I was really excited to see the purpled-skinned Japanese sweet potatoes back at Trader Joe’s! They call them the Murasaki sweet potatoes as they have purple skin and a light-colored flesh with a distinctive nutty flavor. Gosh I love them. I roasted the sweet potatoes along with some vegetables and melted cheese. More jalapeños too! 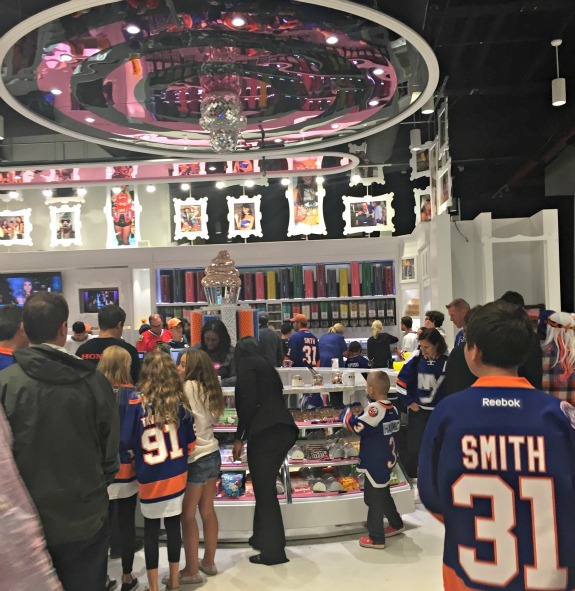 I headed straight to Sugar Factory inside the Barclays Center to make a candy bag. The Sugar Factory at the Barclays Center is honestly lacking in their selection of chocolate candy though! I could use more chocolate covered options, you know? Like chocolate-covered cookie dough and brownie dough and chocolate covered pretzel poppers! They don’t have any of that! I went with chocolate covered raisins and m&m’s. 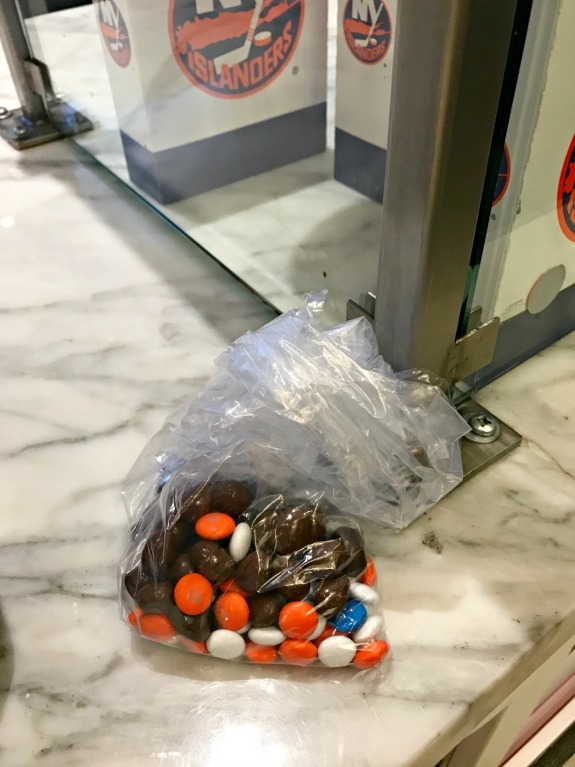 They were even low on Reeses Pieces which leads me to believe there was Nets game the night before and no one thought to refill the candy bins. It’s not right! 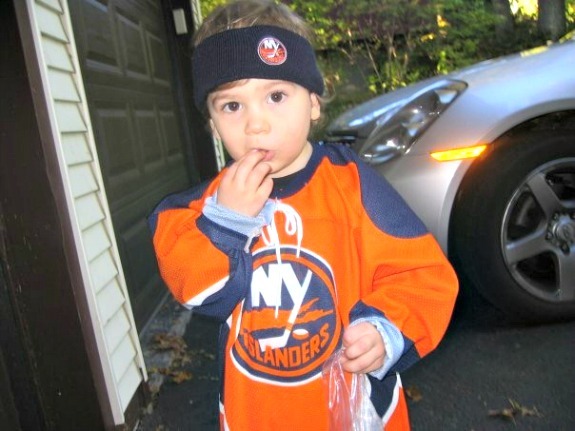 The Islanders fans matter too! 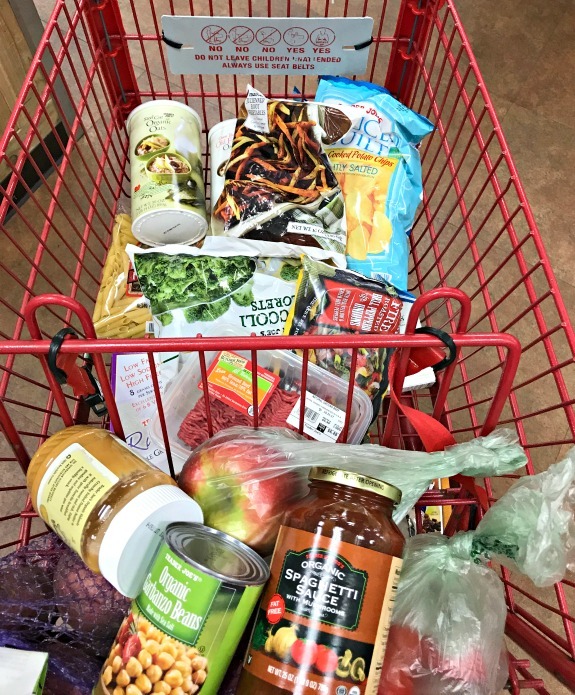 And just a couple of things about my recent Trader Joe’s shop aside from being excited about the Japanese sweet potatoes! I know Trader Joe’s has been selling the julienned root vegetables in their frozen section for a long time now but this is the first time I have bought a bag. Definitely a new favorite of mine! There’s just a hint of a spice to them and they heat up really well in the microwave. The julienned root vegetables are great as is, with salads or as a side dish. I think I’ve melted cheese on them a few times too. Do you like kabocha squash? I remember it became all the blog rage a few years ago but I never really liked it. Did Trader Joe’s always sell it in the frozen section? I didn’t buy it but I noticed it for what I think may be the first time? Please let me know if this is new. Thanks. I would talk Halloween but it doesn’t matter much to me anymore. My son doesn’t dress up and certainly doesn’t go trick or treating with me at this point. Here’s a picture of him from when he was two years old though on Halloween. Not to mention, Halloween became really glum yesterday afternoon when we saw what happened in the city. I just happened to change the channel on the television to the news, right before I was taking my son back to his high school where he was participating in something called Safe Halloween. Safe Halloween provides the younger kids in the area a safe place to trick or treat. They have lots of Halloween activities and candy and the older kids (like my son now) give the candy out. It’s a safe place for them which we all really need right now! I can’t get over what happened in the city, right on the bike path that plenty of us know well. Really scary, very sad and just not okay at all. Be sure to visit Sprint 2 The Table to see what everyone else is eating today! Which type of potatoes are your favorite? 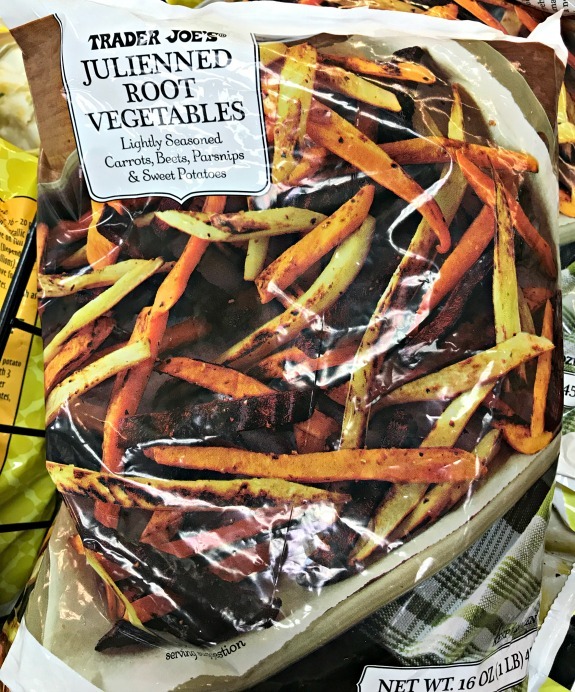 Have you ever tried Trader Joe’s julienned root vegetables? What did you think? Favorite type of chocolate-covered candy? It is such a shame what happened yesterday, scary too. New Yorkers will unite though to support each other and show just how strong we are in the face of events like this. On a completely unrelated topic, I love sweet potatoes and am dying to try purple or Japanese ones! I haven’t seen that kabocha before! But now I really want to buy it because I am always intimidated by the giant thick-skinned kabochas in the produce section. I’ve never tried the julienned veggies either, but they look great. Favorite potato is any kind of sweet potato. 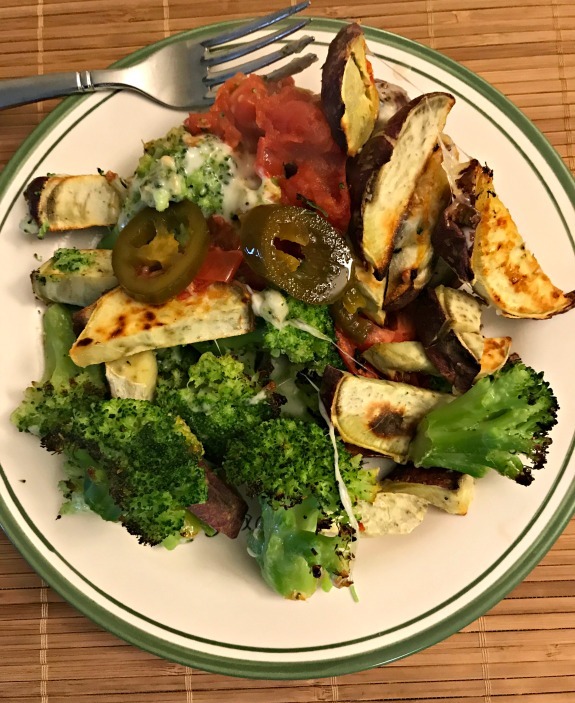 And OMG melting cheese on top of roasted veggies? GAME CHANGER! Those julienned root veggies look SO GOOD! And I love that you and your son do so many things together. You truly a sweet mom. Your son is really blessed. It makes me thankful for how God gave me such amazing parents too. I’ve been loving giant salads this past week, because we have a TON of greens that we need to finish. It’s amazing how a salad can be good and filling with the right toppings. Omg those sweet potatoes are SO good! I get so mad I can’t find them at my local grocery store, I need to drive to a health food store or TJ’s for them. And I am all about any candy, especially anything chocolate covered! Those potatoes are the bomb! I am a huge sweet potato fan and I like Kabocha squash too! I pretty much love all chocolate candy, but especially anything with peanut butter too! 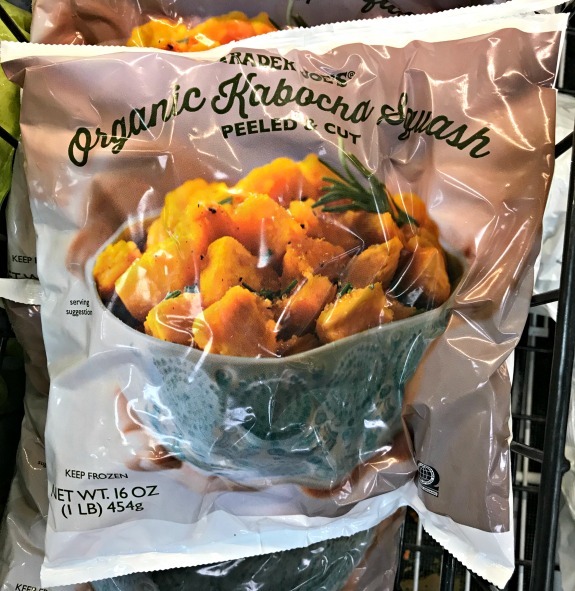 I don’t know why but I never got into the kabocha squash – I did try though! if you don’t put too many chia seeds, you don’t notice them. I would get uncomfortable if I saw them all over my oatmeal too. and yes! 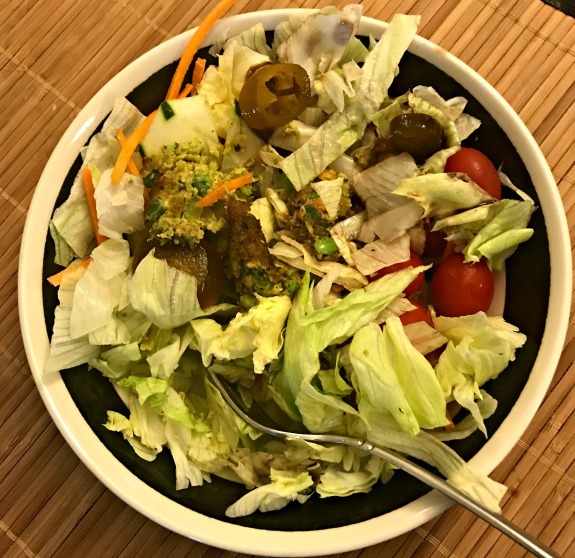 do try adding a veggie burger to a salad!